Legume flours, due to their phenol and fibre content, are ideal ingredients for improving the nutritional value of bakery products. In this study, artichoke stem powder (ASP) was used to substitute 0%, 2.5%, 5%, 7.5% and 10% of wheat flour for making breads. Proximate composition of wheat flour and ASP were determined. Bread qualities and total phenols content were analyzed and compared with those of wheat bread. Results show that ASP contained 10.37% moisture, 10.28% ash, 11.53% protein, 0.86% fat, 51.29% fibre and 1350 mg EAG/100g d.m. ASP addition considerably modified the bread quality: altered appearance and texture, darker crumb and more intense odour were observed. From the sensory evaluation, tastes of bread with higher content of ASP (7.5 and 10%) were the most acceptable for assessors. 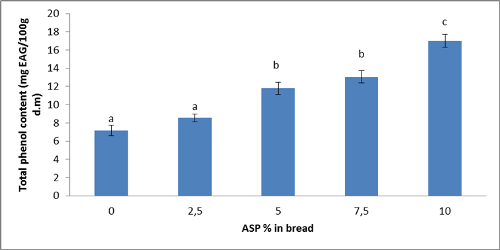 Total phenol contents of breads significantly increased with the addition of ASP. Therefore ASP may be considered as valuable ingredients for industrial manufacture of functional foods. - M. Hayta, G. Özuǧur, H. Etgü, I.T. Şeker, Effect of grape (Vitis Vinifera L.) pomace on the quality, total phenolic content and anti-radical activity of bread, J Food Process Preserv, 2014, 38(3), 980-986. doi:10.1111/jfpp.12054. - I. Celik, F. Isik, O. Gursoy, Y.Yilmaz, Use of jerusalem artichoke (Helianthus tuberosus) tubers as a natural source of inulin in cakes, Journal of Food Processing and Preservation, 2013, 37(5), 483-488. doi:10.1111/j.1745-4549.2011.00667.x. - S. Mildner-Szkudlarz, R. Zawirska-Wojtasiak, A. Szwengiel, M.Pacyński, Use of grape by-product as a source of dietary fibre and phenolic compounds in sourdough mixed rye bread, Int J Food Sci Technol, 2011, 46(7), 1485-1493. doi:10.1111/j.1365-2621.2011.02643.x. - B. Bchir, H.N. Rabetafika, M. Paquot, C. Blecker, Effect of pear, apple and date fibres from cooked fruit by-products on dough performance and bread quality, Food Bioprocess Technol, 2013, 7(4),1114-1127. - MR. Romero-Lopez, P. Osorio-Diaz, LA. Bello-Perez, J. Tovar, A.Bernardino-Nicanor, Fiber concentrate from orange (Citrus sinensis L.) bagase: Characterization and application as bakery product ingredient, Int J Mol Sci, 2011, 12(4), 2174-2186. - M .Elleuch et al., Dietary fibre and fibre-rich by-products of food processing: Characterisation, technological functionality and commercial applications: A review, Food Chem. 2011;124(2): 411-421. - W. Peschel et al., An industrial approach in the search of natural antioxidants from vegetable and fruit wastes, Food Chem, 2006, 97(1), 137-150. - D .Ruiz-Cano et al., Chemical and functional properties of the different by-products of artichoke (Cynara scolymus L.) from industrial canning processing, Food Chem, 2014, 160,134-140. - S. Dabbou et al., In vitro antioxidant activities and phenolic content in crop residues of Tunisian globe artichoke, Sci Hortic (Amsterdam), 2015, 190,128-136. - EN Fissore et al., Upgrading of residues of bracts, stems and hearts of Cynara cardunculus L. var. scolymus to functional fractions enriched in soluble fiber, Food Funct, 2014, 5(3), 463- 470. - A. Femenia, J.A. Robertson, K.W. Waldron, R.R. Selvendran. Cauliflower (Brassica oleracea L), Globe Artichoke (Cynara scolymus) and Chicory Witloof (Cichorium intybus) Processing By -products as Sources of Dietar y Fibre, J Sci Food Agric, 1998, 77, 511-518. - M.J. Frutos, L. Guilabert-Anton, A. Tomas-Bellido, J.A Hernandez-Herrero. Effect of Artichoke (Cynara scolymus L.) Fiber on Textural and Sensory Qualities of Wheat Bread. Food Sci Technol Int. 2008, 14(5 suppl), 49-55. doi:10.1177/1082013208094582. - AOAC, Official Methods of Analysis, 15th ed. Washington, DC: The Association of Official Analytical Chemists, 1995. - AOAC, Official Methods of Analysis, Washington DC: The Association of Official Analytical Chemists, 1992. - MC Bourne, Food Texture and Viscosity, Elsevier, 2002. - A. Djeridane, M. Yousfi, B. Nadjemi , D. Boutassouna, P. Stocker, N. Vidal. Antioxidant activity of some algerian medicinal plants extracts containing phenolic compounds, Food Chem, 2006; 97, 654-660. doi:10.1016/j.foodchem.2005.04.028. - T. Claus, S.A. Maruyama, S.V. Palombini et al. Chemical characterization and use of artichoke parts for protection from oxidative stress in canola oil. LWT - Food Sci Technol. 2015; 61: 346-351. doi:10.1016/j.lwt.2014.12.050. - J. Wang, CM. Rosell, CBD. Barber, Effect of the addition of different fibres on wheat dough performance and bread quality, Food Chem, 2002, 79, 221-226. doi:10.1111/j.1745-4603.2010.00239.x. - MM. Salas-Mellado, YK. Chang. Effect of formulation on the quality of frozen bread dough, Brazilian Arch Biol Technol. 2003; 46(3):461-468. doi:10.1590/S1516-89132003000300018.